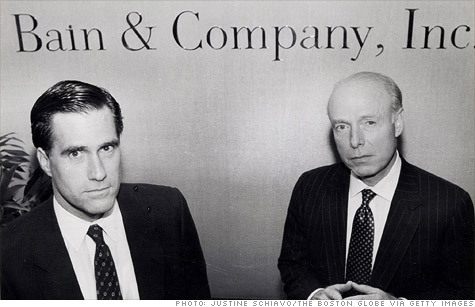 Mitt Romney and William Bain Jr. at Bain's offices in 1990. NEW YORK (CNNMoney) -- Forget taxes, gun rights and gay marriage. The new hot-button campaign issue is private equity. Long a favorite line of attack for Democrats looking to paint Mitt Romney as an out-of-touch financier, Republicans are now criticizing the former Massachusetts governor's tenure at Bain Capital. Specifically, Romney's rivals allege that the specialized, rough-and-tumble brand of capitalism practiced at Bain resulted in an unacceptable number of lost jobs. Newt Gingrich -- who once promised to run a relentlessly positive campaign -- has in recent days repeatedly cited a Reuters story that describes Bain Capital's investment in a Kansas City steel mill that eventually failed. "You would certainly have to say that Bain, at times, engaged in behavior where they looted a company, leaving behind 1,700 unemployed people," Gingrich said Sunday during the most recent GOP debate. And a pro-Gingrich super PAC called "Winning Our Future" has produced a 28 minute video on Romney called "King of Bain." "A group of corporate raiders led by Mitt Romney, more ruthless than Wall Street," a narrator says in an excerpt. "For tens of thousands of Americans, the suffering began when Mitt Romney came to town." "There is something inherently wrong when getting rich off failure and sticking it to someone else is how you do your business, and I happen to think that is indefensible," the Texas governor said in reference to Romney's time at Bain. On the flip side, Romney touts his time at Bain as a positive -- both in terms of job creation, and as an experience that gives him a special insight into the economy that his opponents lack. But what is Bain Capital? And what role did Romney play at the company? After earning degrees from Harvard Law and Harvard Business School, Romney landed at consulting firm Bain & Co., and was subsequently tapped to lead Bain Capital in 1984. Bain Capital initially specialized in venture capital deals -- a strategy that requires investors to take an equity stake in a developing or struggling company that might otherwise not have easy access to capital. But Bain eventually moved into more lucrative, and risky, investments called leveraged buyouts. And those transactions are now giving Romney's opponents plenty of ammunition. A cousin of the hostile takeover, leveraged buyouts allowed Bain to take a controlling stake in companies through deals that were financed mostly by debt and ended with the target going private. Once in control, private equity firms typically cut costs at the acquired company, a strategy that sometimes includes layoffs and restructuring. Along the way, firms like Bain Capital often take substantial payments in the form of dividends and fees. And the target companies are often later sold -- or fail. The most complete accounting of Bain Capital's record while Romney was at the helm was published Monday in the Wall Street Journal. After examining 77 Bain investments made between 1984 and 1999, the paper found that 22% of the companies declared bankruptcy or closed within eight years of Bain's initial investment. And poor performance led Bain to forfeit its investment in another 8%. But there were notable successes, including pizza chain Dominos and office supplier Staples. Typical private equity funds only receive a fraction of the winnings from their successful deals. The rest goes to investors. But the winnings were so large that Romney earned millions. The Journal estimates that for those 77 deals, Bain generated about $2.5 billion on investments of $1.1 billion. Overall, Bain posted gains of 50% to 80% over the period. Romney campaign spokeswoman Andrea Saul said in a statement that Bain Capital "invested in many businesses" and "while not every business was successful, the firm had an excellent overall track record and created jobs with well-known companies like Staples, Dominos, and Sports Authority." Romney has said that he created 100,000 net jobs while at Bain. But because Bain doesn't track the number of jobs it has created, or destroyed, that is a dubious figure, as Dan Primack at Fortune has pointed out. In an election cycle where income inequality and the economy are expected to be hot topics, Romney's record at Bain is likely to remain in the spotlight. "As we'll find out, free enterprise will be on trial," Romney said Monday. "I thought it was going to come from the president, from the Democrats, from the left, but instead it's coming from Speaker Gingrich and apparently others."